3D glasses? For an opera? Opera may now be a frequent sight in cinemas across the country, but self-confessed art “omnivore” and composer Michel van der Aa is bringing cinema into musical theatre. The use of 3D in his latest work in conjunction with ENO, Sunken Garden, certainly makes for a unique experience, with live performers in front of cinematic backdrops. 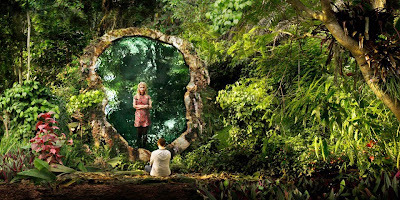 This is an immersive experience, the titular world coming to life with gently rustling plants and shimmering pools, whilst the 3D effect creates a sense of depth far beyond (and into) the theatrical space. The onstage action appears static by comparison, though interactions between the live performers and the video utilise some clever effects to bring theatre and cinema together. The success of the 3D, however, is largely dependent on the viewing angle – pick a bad seat and the effect is somewhat diminished and blurred. Sunken Garden is a unique experience beyond the 3D. Never has the Wagnerian term ‘Gesamtkunstwerk’ been more appropriate to a modern opera. This is a multimedia piece that moves fluidly between theatrical and musical genres, fusing cinema with theatre, documentary filmmaking with opera. It’s an ultra-modern piece of technological theatre that could only be possible in this day and age. There is narrative purpose behind the use of cinema too. The protagonist is Toby Kramer, a video-artist researching the disappearance of one Simon Vines. His documentary is the video we watch on screen. Soon, however, Toby (and the audience) is sucked into the sunken garden – a 3D realm and limbo between life and death for people who have been implicated in the death of a loved one. Wracked by guilt they must ultimately choose whether to die peacefully in the garden, or live with their decisions. The libretto, from Cloud Atlas author David Mitchell, is the weakest element of the piece. Like his novel, the plot works on a number of different levels – whodunit, documentary and perplexing existential philosophy – but is intriguing predominantly on a technical narrative level rather than an emotional one. Sunken Garden lacks lucidity in its ideas, with absurd twists more akin to an episode of Doctor Who meets Skins, not helped by some occasionally questionable acting. Moreover, Mitchell’s stilted libretto does not lend itself to word-setting. Some of the aria-like cinematic episodes incorporate yearning melodic leaps, but for the most part the live recitative singing is jagged and lacks lyricism. Throughout, the singers cope well with some difficult material. As a student of musical engineering, it’s clear that Van der Aa excels at instrumentation and texture rather than writing for voice. In parallel to the visuals, the score fuses genres: opera, modern classical music, experimental electronics and dance music. As such, it predominantly comprises strings accompanying the highly chromatic vocal lines, with a soundtrack of found sounds and clipped samples. The heavy use of apparent atonality adds to the unsettling, mysterious mood of the piece, whilst technology reflects the almost futuristic feel of the opera at large. One particular moment sets the clipped samples into a dance beat that suitably reflects the on-screen club scene. Musical elements such as this are clearly aimed at enticing a younger, technologically aware audience – an audience typically put off by the old-fashioned stereotype of opera. On the other hand, a traditional audience may be unwilling to accept this as opera owing to the heavy influence of cinema. Certainly, there is much merit in the fusing of genres that adds an extra dimension to the visuals. Whether this is the future of opera, though, is another question. As with cinema, can 3D really be anything more than just a fad or gimmick? For some, myself included, it’s a welcome addition and a worthwhile experience – but its application must never overshadow the narrative, which is sadly largely the case here. Watch: Sunken Garden is performed at the Barbican from 12th-20th April.